When paired with ZOOM’s workforce optimization software, our new Salesforce CRM Toolbar enables a seamless experience for the agent, tightly integrating with ZOOM’s quality management, customer experience and workforce management features to help businesses deliver exceptional customer service. ZOOM is proud to partner with internationally renown integrator Bucher+Suter to deliver a world-class agent toolbar. 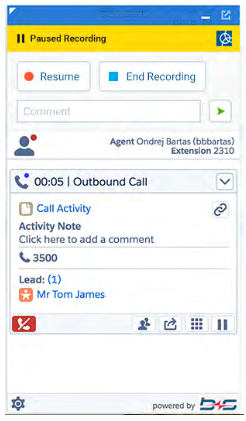 Determines the recording status of the agent’s phone number and provides a visualization of this information directly within the Salesforce agent desktop toolbar. SERVING our customers We are backed by an industry leading 87 NPS. INNOVATION as part of our culture Award winning WFO leader, recognized by analysts and industry experts. LOYALTY to our channel partners ZOOM is an indirect only sales company with exceptional partners.